Saffron Walden Town Band was reformed in the early 1980s. It is a community based ensemble of woodwind, brass and percussion players. We currently have around 40 members who meet each week to rehearse in a relaxed and friendly environment. The Band enables musicians of all ages and abilities to come together to make music, have fun and share musical knowledge and enthusiasm with others. We have a very wide and varied musical repertoire with something to suit everyone including, classical, popular and light music as well as music from films, shows and the occasional march! Some of the pieces that we play are straight forward whilst others are some-what demanding of our talents! However we continuously strive to develop and improve our musical understanding and performances, as well as the overall quality of sound that the band produces. There are no auditions! Everyone is welcome. 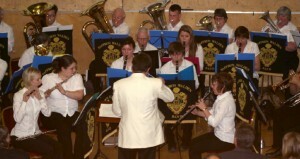 The band holds 3 main concerts each year in and around Saffron Walden. We also perform at other local events and raise money for various different charities. 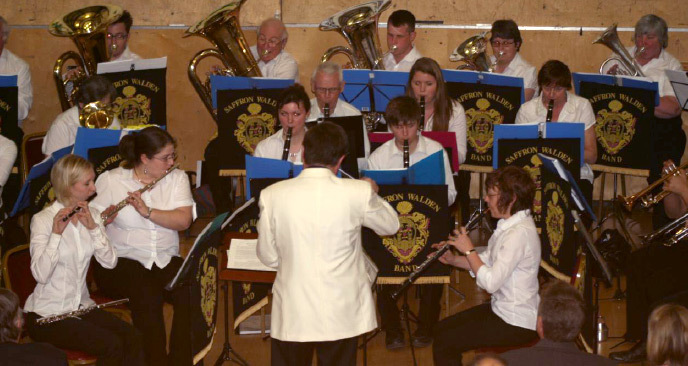 In June 2010 we formed the Junior Band to cater for young people between the ages of 8 and 13 who are just starting their musical adventures. The youngsters are a lively and enthusiastic group. We aim to provide the children with the opportunity to experience musical challenges and develop their musical awareness. They are encouraged to perform at the main band concerts and to take a pride in their musical abilities, but most of all to have fun.